There couldn’t have been a better time to bring L. Frank Baum’s children’s book “The Wonderful Wizard of Oz” to life in film. In the late 30s the film medium was more innovative than it has ever been. Adapting the colorful book into an equally colorful movie though was full of trials and tribulations. “The Wonderful Wizard of Oz” was published in 1900, and was the best-selling children’s novel for two years after its publication. 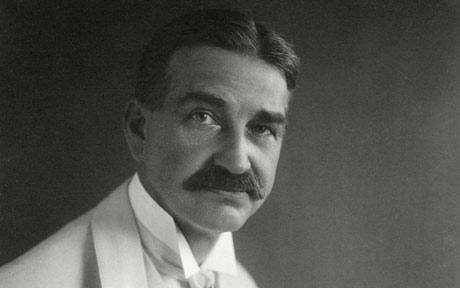 L. Frank Baum was born in 1856 in Chittenago, New York. He was 7 of 9 children, only 5 of which survived into adulthood. When he was younger he spent 2 years at Peekskill Military Academy and was severely disciplined for daydreaming, he left the Academy after suffering a psychogenic heart attack. 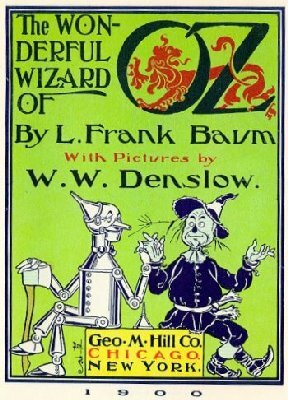 In 1902 Baum wanted to follow-up his successful book “The Wonderful Wizard of Oz” with a theatrical production. Baum and Denslow met with composer Paul Tietjans and director Julian Mitchell to produce the stage version. The play first opened in Chicago in 1902 and ran on Broadway for 293 stage nights. It would make reappearances on Broadway. “The Wonderful Wizard of Oz,” illustrated by W.W. Denslow, was his greatest critical/financial success. When opening early versions of the book you could find the quote “to my good friend & comrade, My Wife.” L. Frank Baum married his wife Maud in 1882 and they stayed together through his death. Baum’s novel was adapted into a 1925 film that met little success. Samuel Goldwyn obtained the rights to the novel in the 30s and let MGM go ahead a produce the adaptation. After the success of Walt Disney’s “Snow White and the Seven Dwarfs” MGM was convinced that films adapted from popular children’s stories and fairytale folklore could be successful. The script went through several writers, many writers were approached without knowledge that their competitors were also being approached. They were told to write the first few pages, some took inspiration from 3 previous adaptations created in 1910, 1925, and 1933, some took inspiration from older versions of the Broadway play. 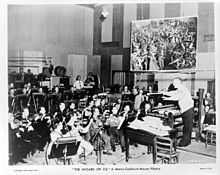 The movie would be a musical, featuring music composed by Harold Arlen and lyrics by E.Y. “Yip” Harbug. Bits and pieces of each writers early drafts were mixed into the final script. Noel Langley lead the adaptation, though Victor Fleming revised the final draft. The script was finally completed in 1938., but the studio began expressing concern, thinking that 1939 culture was too sophisticated for Oz. In Baum’s book, the Kansas countryside is described as “in shades of gray” thus came the idea to use monochrome sepia tones for the Kansas scenes. 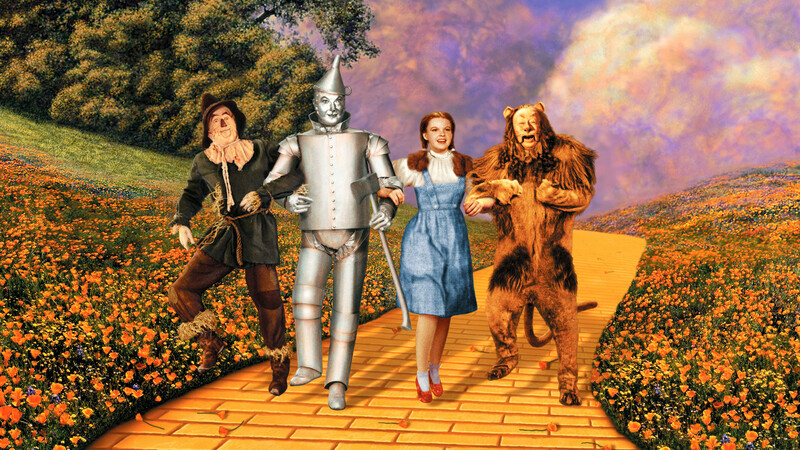 “The Wizard of Oz” also went through a couple different directors. George Cukor had taken over directing, but he never actually shot any scenes. Cukor acted as a creative advisor to the troubled production on November 3, 1938, he left due to a prior commitment to direct “Gone with the Wind” a production that he was later fired from and replaced by Victor Fleming. Victor Fleming didn’t shift the film from Cukor’s creative alignment though, once he stepped in. The production of the film was, at many times, a disaster. 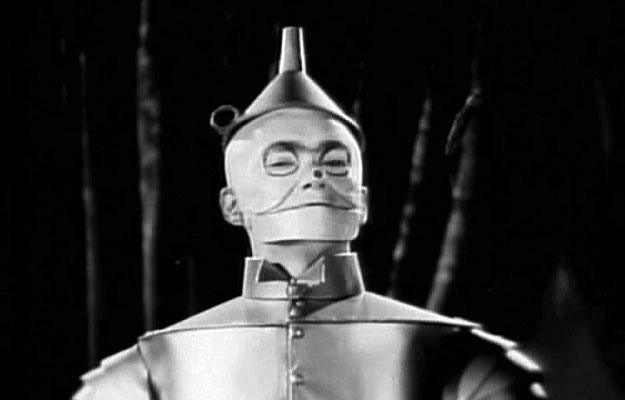 Actor Bubby Ebsen was originally slated to play Tin Man, but he suffered a reaction to the aluminum powders in the makeup. Ebsen was hospitalized, and in a late DVD interview stated that studio heads didn’t believe he was sick until they saw himat the hospital convalescing in an iron lung. Ebsen’s voice can still be heard in some songs that involve a group of singers. Re-casting tin man halted production, another mishap win Margaret Hamilton (The Wicked Witch of the West) had to stand on this small elevator during, that either went down slowly or down fast. Fire and smoke would erupt from the contraption, and on the 2nd take the timing was off and the grease in the copper-based makeup Hamilton had on, caught fire. She spent six weeks in the hospital before returning to filming. 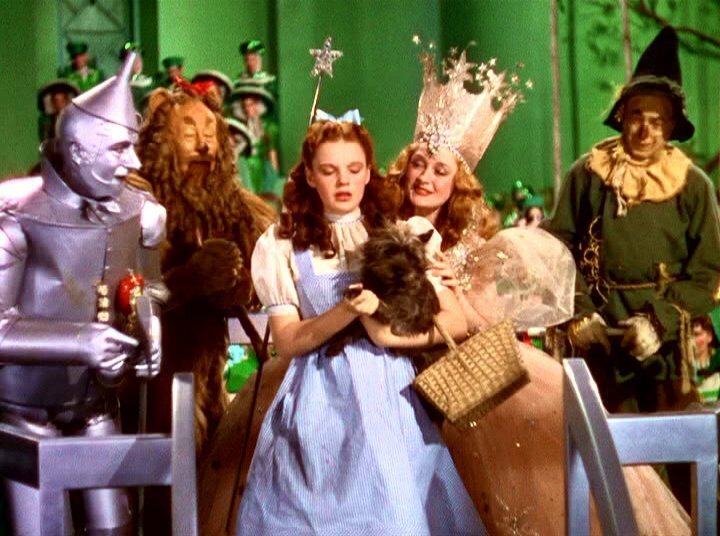 Technicolor was a new process, and “The Wizard of Oz” was unintentionally symbolic of film’s ultimate transition to color. 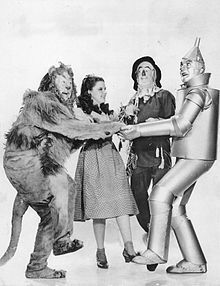 However, shooting the Technicolor sequences was a long and cumbersome process that ran from October 1938 to March 1939. Key actors would work 6 days a week as early as 4 or 5 a.m. to 7 or 8 p.m. The process of getting the actors into costumes and makeup was long and tedious. The heavy costumes and makeup were also made more uncomfortable by the daylight bright lighting that the early Technicolor process required. 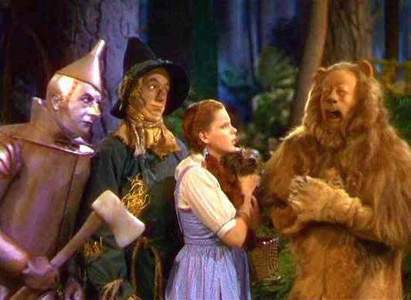 Sets would heat over 100° F. In a later interview Ray Bolger (Scarecrow) said that Oz principals were banned from eating in the studio’s commissary, so that they wouldn’t get any food on the costumes. 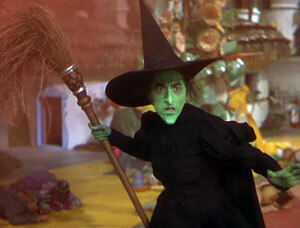 Margaret Hamilton couldn’t eat solid food during production, living on a liquid diet. On February 12, 1939 Victor Fleming hastily replaced George Cukor in directing “Gone with the Wind” (A story for another time). King Vidor finished directing the remaining scenes which were primarily Kansas scenes. Post-production was also a tedious process. The MGM art department has to create matte paintings as backgrounds for many scenes, Herbert Stothart composed a background score, and special effects were added including rear projection shots. When test screenings began on June 5, 1939 the original cut was two hours, when the studio was aiming for a more friendly 1.5 hours. The “Over the Rainbow” number was almost cut entirely. The studio thought with the number the film stayed in the monochromatic Kansas too long. Victor Fleming and producer Mervyn LeRoy fought to keep it in. “The Wizard of Oz” earned an initial worldwide box-office of $3,001,700, which was strong, but the production was expensive. MGM reported a loss of $1,145,000, but a re-release in1949 earned the film an additional $11.5 million to make-up for the loss. The film would lose the Best Picture Oscar to “Gone with the Wind,” but it has cemented its place in film history, and proved that live action film could take us somewhere magical. “The Wizard of Oz” is one of those great films where every film that came after it owes “The Wizard of Oz” a piece of its inspiration. One of the most innovative films ever created for the medium that was created through the blood, sweat, tears, and passion of human creativity.